Guess what? I've been living a lie. All these years, I've just been pretending. All that smiling and nodding like I knew what was going on, when I really had no clue. But it is time to come clean. I had no idea what googly eyes are. I should have asked the very first time someone described another person as having them. I should have stood up and admitted my ignorance. There would have been pointing and laughing, but I've dealt with that before. At least then I would have been enlightened for the next time. But I wanted to fit in, so I kept my mouth shut. Then I promptly shoved all thoughts of that trauma out of my consciousness. And the next time someone mentioned that So-and-so had googly eyes, I didn't make a peep. Asking questions is something I love to do, but somehow I felt embarrassed about the entire thing. Things finally came to a head during the last staff meeting I attended. My brain began obsessing about googly eyes. It's a wonder I was even able to sit still, with all the questions in my head. I am just lucky that no one tried to talk to me, as I am not sure what would have come out of my mouth. 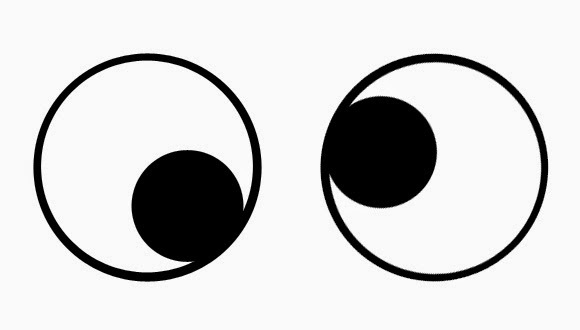 What the heck are googly eyes? If someone has googly eyes, does that mean their eyes pop out of their head, like in Beetlejuice? Is it a glandular thing? I've heard women say that a man was making googly eyes at them--should I be concerned? Is that a sign that a person is in love? Do we all make googly eyes when we're in love, or when we see something we're scared of? Does it mean that the eyes are rotating counter clockwise? Oh wait--that just means crazy. Or possessed, depending on the movie. No, that's just the head that turns, not the eyes. Not googly. Embarrassment is the great motivator. After years, I decided to search the web for answers. That's right, I consulted the Google about the googly eyes. These, my friends, are googly eyes. Balance has been restored to my corner of the universe. And if this subject ever comes up as a trivia question on Jeopardy! I am set. Very funny! I really enjoyed reading about your discovery of the meaning of googly eyes. I too often use the urban dictionary to decode slang I hear my children say. It's very helpful. Have you ever seen a baby who looks drunk after a nice, long feeding? You know kinda drowsy woozy smiling with crazy looking eyes? This is what I see in my mind on an adult's face when I think of googly eyes. I have been accused of having googly eyes. So now have you been making googly eyes, or just googling eyes? Love this post! I've been a big fan of googly eyes from way back as a kid collecting stickers. I had stickers with googly eyes of all shapes and sizes - they weren't in love, but their eyes were black BBs that would roll around in clear plastic eyeballs. They were awesome. But now that I think about it, probably actually creepy.